FORT WORTH, Texas (May 3, 2017) – Colonial Country Club, Friends of Golf (FOG) and the Golf Coaches Association of America (GCAA) have announced that Oregon senior Wyndham Clark, Stanford senior Maverick McNealy and Illinois junior Dylan Meyer are the 2017 finalists for The Ben Hogan Award presented by Konica Minolta Business Solutions U.S.A., Inc. (Konica Minolta), given annually to the top men’s college golfer taking into account all collegiate and amateur competitions over the past 12 months. 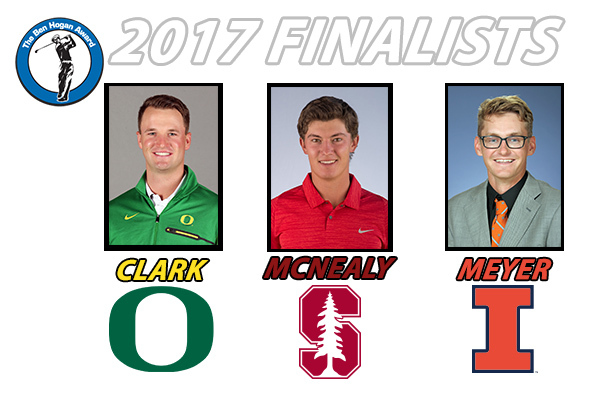 McNealy is a three-time finalist for the award, while Clark and Meyer are final three rookies. 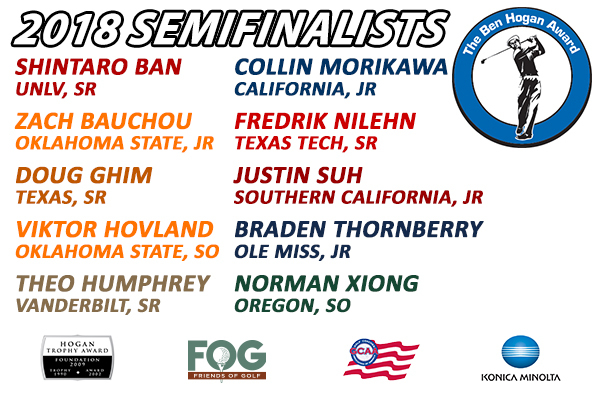 This is the sixth occasion that a Stanford golfer has been a finalist, while Oregon and Illinois are being represented for the first time. 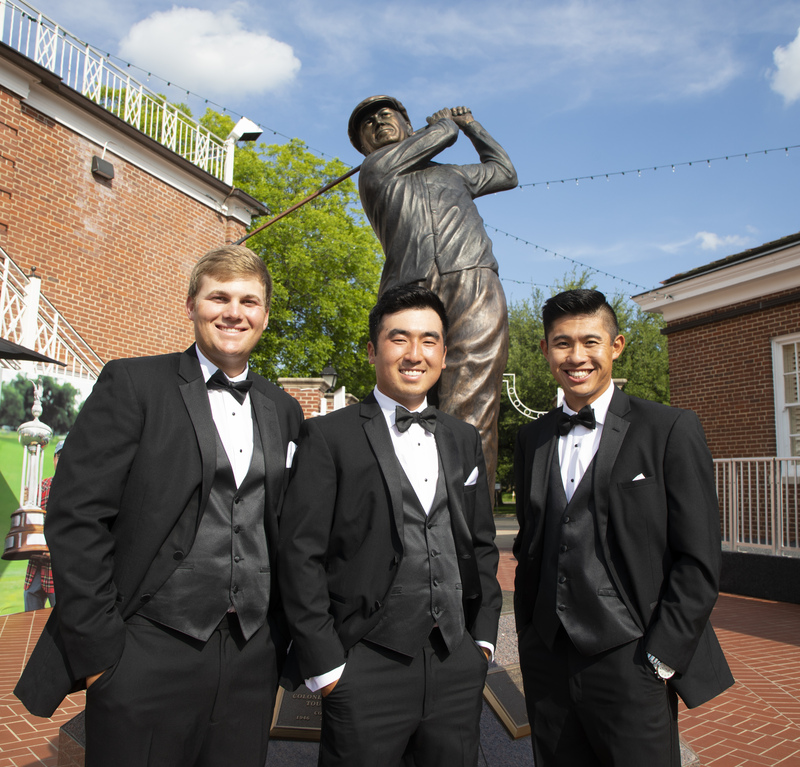 The three student-athletes will attend a black-tie dinner at Colonial Country Club on Monday, May 22, where the winner will be crowned. 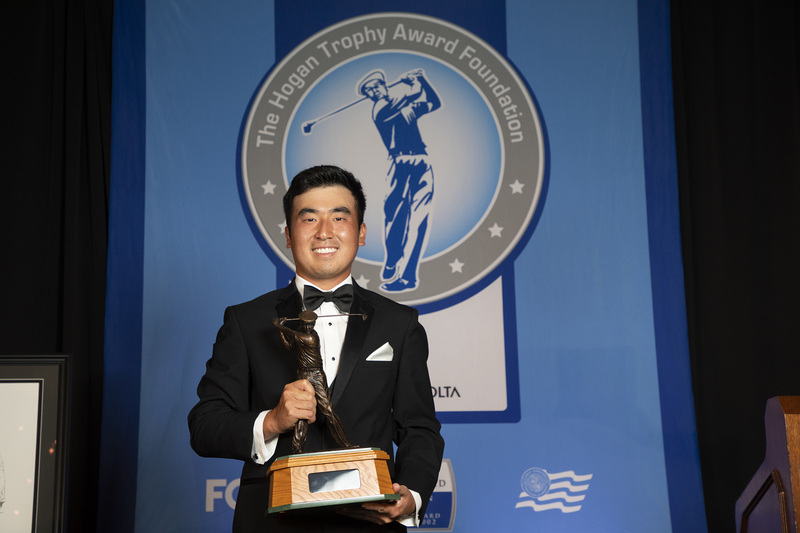 The 2017 Ben Hogan Award recipient will receive the first exemption into the PGA TOUR’s 2018 Dean & DeLuca Invitational, as well as earn a $30,000 grant for its men’s golf scholarship program. Clark has won three college tournaments this season, including the Pac-12 Conference Championship, an event that featured five Hogan Award semifinalists. He is currently ranked No. 1 in both the Golfstat and Golfweek/Sagarin rankings. Oregon’s first conference medalist since 1978 led the Ducks to their first outright conference title since 1959. In addition to his three wins, which also included the Arizona Intercollegiate and Wyoming Desert Intercollegiate, Clark has three runner-up finishes, and has placed inside the top 15 in all 11 events. During the 2016-17 season, he owns a 69.45 stroke average over 31 rounds. Eighteen of his rounds have been scores in the 60s. On the amateur circuit, Clark advanced to the round of 32 at the 2016 U.S. Amateur after tying for sixth in the stroke-play portion of the event. In addition, he shared 20th place at last summer’s Western Amateur. In March, the native of Denver, Colo., earned status on the 2017 Mackenzie Tour by placing among the top 10 at the Canada-based tour’s qualifying tournament. McNealy sits atop the World Amateur Golf Ranking, and was the winner of the 2016 Mark H. McCormack Gold Medal as the year’s No. 1 player. He represented the United States at the 2016 World Amateur Team Championship and has been named to Team USA for the 2017 Arnold Palmer Cup. He is ranked 12th in the Scratch Players World Amateur Ranking. 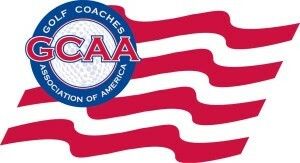 The product of Portola Valley, Calif., is listed third in both the Golfstat and Golfweek/Sagarin college rankings. McNealy carries a 70.00 stroke average over 26 rounds, with eight top-20 finishes in 10 events, including five top-fives. His fall victory at the Nike Golf Collegiate Invitational at Colonial Country Club was his 11th career win, tying him with Tiger Woods and 2014 Hogan Award winner Patrick Rodgers for most in school history. He is one of five players currently ranked among the top 12 in all four major college and amateur ranking systems. McNealy, who also was a finalist in 2015 and 2016, is the second three-time finalist ever, joining Bill Haas (2002-04). Meyer picked up wins in all three of his starts in April, capped off by a victory at the Big Ten Conference Championship. In addition to his crowns at the Robert Kepler Intercollegiate and 3M Augusta Invitational, he has also recorded a trio of runner-up finishes as well as a third-place showing among his 10 top-10s this season. Over 30 collegiate rounds, Meyer owns a 70.33 stroke average. Last summer, Meyer was crowned the 2016 Western Amateur champion after four match play victories. In addition, he advanced to the quarterfinals of the 116th U.S. Amateur, and posted strong showings at the Sunnehanna Amateur (T-4th) and Players Amateur (12th). In 2017, he took seventh at the Jones Cup Invitational and 12th at the Australian Master of the Amateurs. The native of Evansville, Ind., is ranked third in the Scratch Players World Amateur Ranking, fifth in the World Amateur Golf Ranking, eighth in the Golfweek/Sagarin listings and 11th in the Golfstat ranking. Since 2002, the Colonial Charitable Foundation has awarded more than $500,000 in scholarships to over two dozen schools. This year, $84,000 in grants will be distributed, with $30,000 going to the winner’s university, $15,000 to the two finalists’ schools and $3,000 each to the seven semifinalists’ universities and one wild-card college drawn from the original watch list. 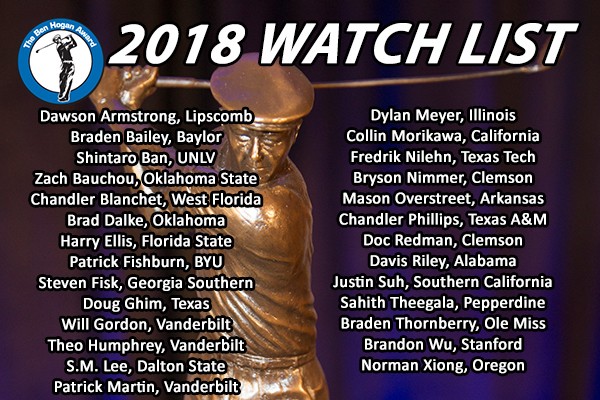 The Ben Hogan Award selection committee is made up of two dozen leaders and experts in amateur, college and professional golf. In order to determine the finalists, each committee member cast a ballot that ranked the group of 10 semifinalists from 1-10. 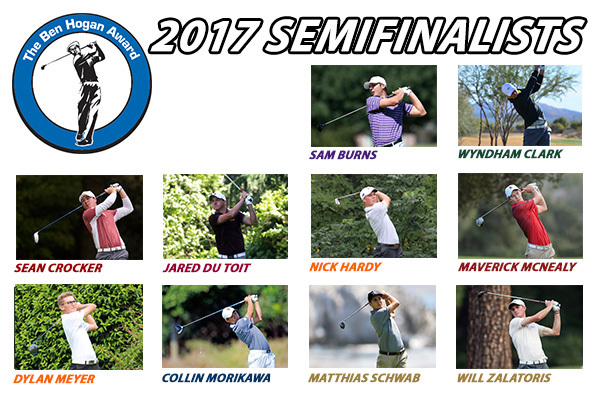 In addition to Clark, McNealy and Meyer, this year’s semifinalists included: Sam Burns (LSU), Sean Crocker (Southern California), Jared du Toit (Arizona State), Nick Hardy (Illinois), Collin Morikawa (California), Matthias Schwab (Vanderbilt) and Will Zalatoris (Wake Forest). 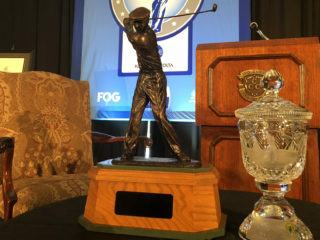 The Ben Hogan Trophy was first presented in 1990 through the Friends of Golf and Bel-Air Country Club and included academic achievement in its original list of standards. 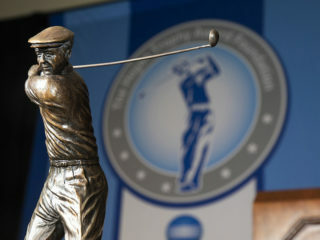 Its criteria was revised for the 2001-02 collegiate season to its current standard of honoring the outstanding amateur collegiate golfer and the Ben Hogan Award was moved to Colonial Country Club. Winners of the Hogan Award have been: D.J. Trahan (Clemson, 2002), Ricky Barnes (Arizona, 2003), Hunter Mahan (Oklahoma State, 2003), Bill Haas (Wake Forest, 2004), Ryan Moore (UNLV, 2005), Matt Every (Florida, 2006), Chris Kirk (Georgia, 2007), Rickie Fowler (Oklahoma State, 2008), Kyle Stanley (Clemson, 2009), Nick Taylor (Washington, 2010), Peter Uihlein (Oklahoma State, 2011), Patrick Cantlay (UCLA, 2012), Chris Williams (Washington, 2013), Patrick Rodgers (Stanford, 2014) and Jon Rahm (Arizona State, 2015 and 2016). Since the committee began inviting all three finalists to Colonial Country Club in 2005, notable finalists include current PGA TOUR players Bud Cauley (2010), Russell Henley (2010), Michael Kim (2013), Cheng-Tsung Pan (2015), Ollie Schniederjans (2014), Jordan Spieth (2012), Michael Thompson (2008) and Kevin Tway (2011). A limited number of seats for the dinner remain. To purchase, call Jimmie Whitt at (817) 972-4280. 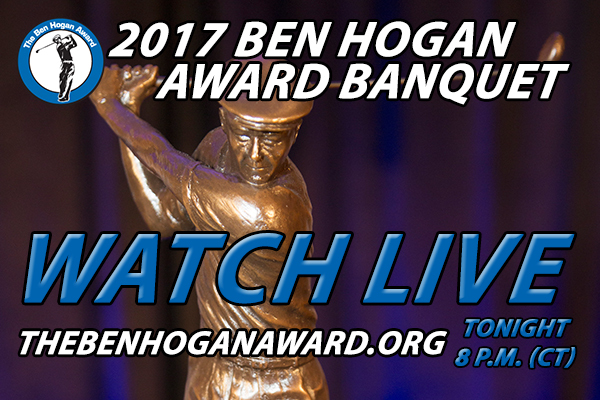 The banquet will be streamed live on TheBenHoganAward.org beginning at 8 p.m. (CT). • The Pac-12 Conference has now had at least one finalist for eight consecutive seasons (2010-17). The Pac-12 has had at least two nominees six straight years, and has boasted 13 of the past 18 finalists dating back to 2012. • A player from the Pac-12 has won The Ben Hogan Award five consecutive years–UCLA’s Patrick Cantlay (2012), Washington’s Chris Williams (2013), Stanford’s Patrick Rodgers (2014) and Arizona State’s Jon Rahm (2015 and 2016). • Maverick McNealy joins Wake Forest’s Bill Haas (2002-04) as the only three-time finalists. 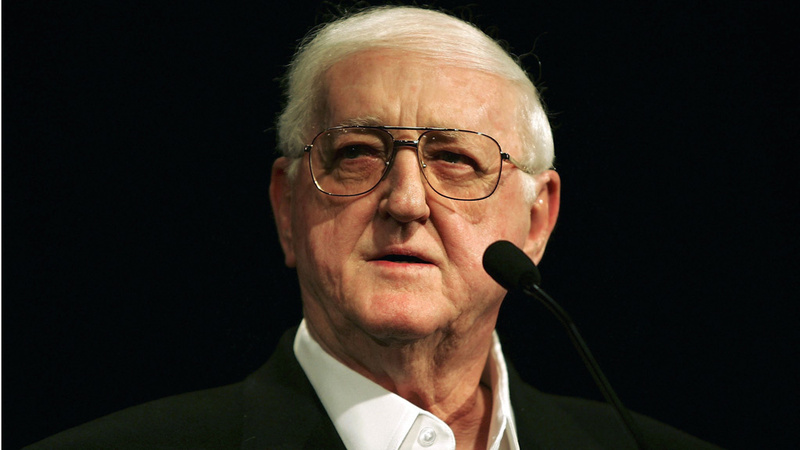 The list of multi-time finalists since the naming of just three finalists began in 2005, includes just six players–Chris Kirk (2006, 2007), Rickie Fowler (2008, 2009), Patrick Cantlay (2011, 2012), Patrick Rodgers (2012, 2014), Jon Rahm (2015, 2016) and McNealy. • Stanford could join Oklahoma State (3), Washington (2) and Clemson (2) as schools with multiple winners since 2002. • Since 2012, Stanford has boasted six finalists courtesy of Patrick Rodgers (2012, 2014), Cameron Wilson (2014) and Maverick McNealy (2015, 2016, 2017). • Dylan Meyer is the first finalist from the Big Ten Conference since Indiana’s Jorge Campillo in 2009 and is attempting to become the league’s first-ever winner. Konica Minolta Business Solutions U.S.A., Inc. is reshaping and revolutionizing the Workplace of the Future™ (www.reshapework.com). With our comprehensive portfolio, we deliver solutions to leverage mobility, cloud services, and optimize business processes with workflow automation. Our All Covered IT Services division offers a range of IT strategy, support, and network security solutions across all verticals. Konica Minolta has been recognized as the #1 Brand for Customer Loyalty in the MFP Office Copier Market by Brand Keys for ten consecutive years and is proud to be ranked on the Forbes 2016 America’s Best Employers list. Konica Minolta, Inc. has been named to the Dow Jones Sustainability World Index for five years in a row. We partner with our customers to give shape to ideas and work to bring value to our society. For more information, please visit www.CountOnKonicaMinolta.com and follow Konica Minolta on Facebook, YouTube, and Twitter @KonicaMinoltaUS.